This evening I made Grilled Asian Style Wild Alaskan Black Cod. What is black cod you ask? Well, it really isn't part of the cod family (so I'm not sure why it is called cod). 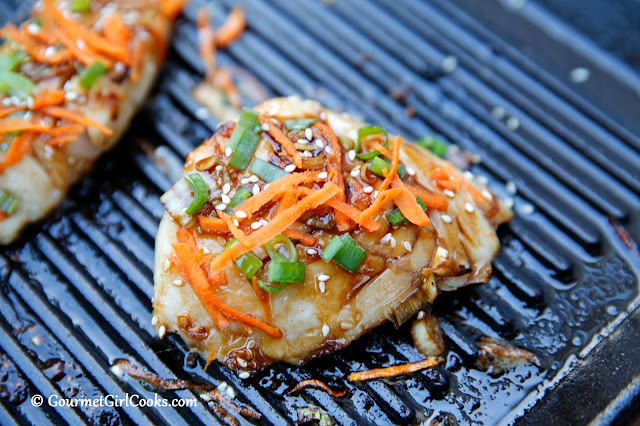 It is commonly referred to as sablefish or butterfish. It's an extremely delicate and tender white fish that has a rich buttery flavor. I first had it while in Cordova, Alaska, recently while dining at the Reluctant Fisherman. My main course that evening was Wild Alaskan Copper River Salmon with Citrus Salsa (it was amazing) but as an appetizer, I enjoyed large succulent lumps of black cod wrapped in bacon. It was absolutely amazing. It literally melts in your mouth. It is very high in Omega 3's (almost as high as wild salmon). It's taste and texture and "gourmet status" makes it an excellent substitute for Chilean Sea Bass. While it's found in the North Pacific, Alaska has the largest population of black cod in the world, the majority of which is exported to Japan. Because of its sustainability status, just like their wild salmon, Alaska carefully manages and protects black cod to prevent it from being overfished. When I returned from Cordova several weeks ago, I immediately placed an order from one of the fishermen, Rich Wheeler, that I met while I was there and who also happens to sell directly (most don't). His company is SenaSea Seafood. I ordered an assortment of fish; wild Alaskan Copper River Salmon, Wild Alaskan Halibut and Wild Alaskan Black Cod. This evening I prepared the Black Cod and it was absolutely amazing! I will definitely be ordering more of this fish in the near future. Speaking of which, after I placed my order, Rich's wife Sena contacted me and gave me a 10% off coupon code to share with my followers to use when placing orders. If you want to give them a try, use code "GOURMETGIRL10". Here is the link to their site: SenaSea Seafood (they ship overnight for free). My fish came beautifully packaged and each fillet was vacuum sealed. I was so excited to cook it on my new Lodge cast iron grill pan that I picked up at Costco this afternoon. I have had my eye on it all summer long and finally decided to "bite the bullet" and get it today...just to cook my black cod on. Just in case a piece of my fish broke off while grilling and flipping it, I didn't want to lose one single morsel to my grill's never-never land. I absolutely loved this fish and will definitely be ordering more of it. 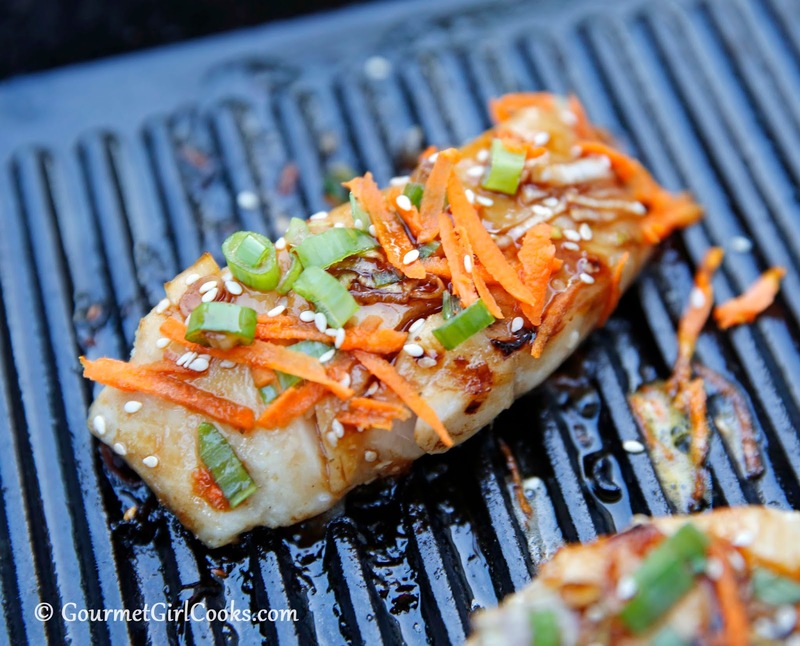 Check out the photos and the easy recipe for my beautiful Grilled Asian Style Wild Alaskan Black Cod below. I served it on a bed of stir-fried cabbage, carrots and scallions. It was delicious. Enjoy! 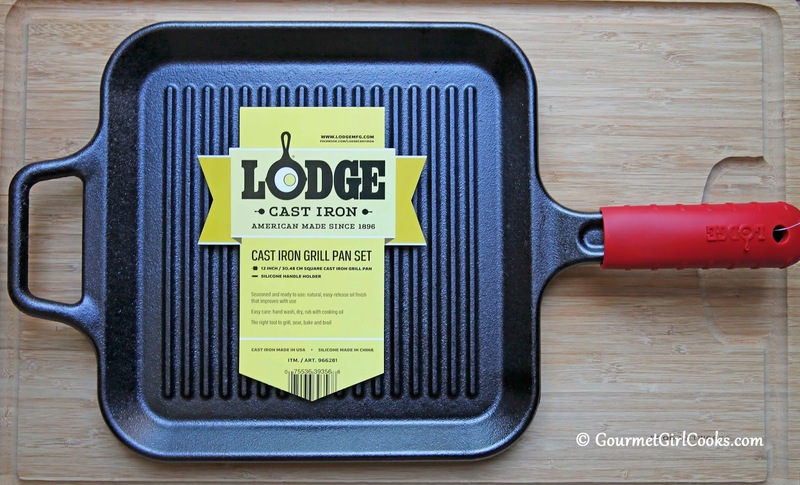 Loved grilling with this pan! In a small bowl, combine Tamari sauce, honey, 1/4 teaspoon sesame seeds, and half of the sliced green onions. Place fillets on a plate. Spoon and brush half of the sauce on the flesh side of the fillets (careful not to cross contaminate sauce with utensils that had contact with the raw fish). 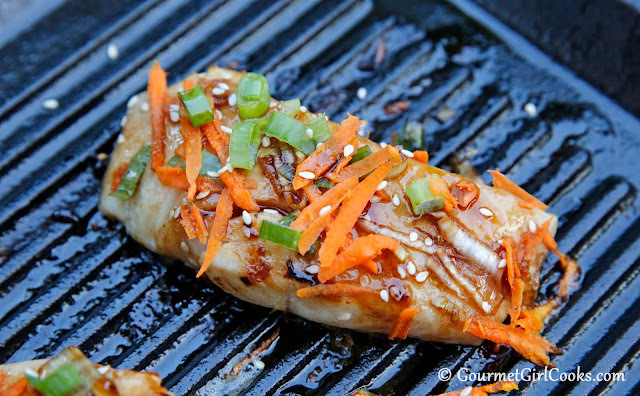 Let sit about 5 to 10 minutes for flavors to permeate fish. Heat grill (and grill pan, if using) to approximately 400 degrees. Lightly grease grill pan or grill with oil. Place fish flesh side down on hot grill and cook for 3 minutes. Carefully flip fillets over. Brush with remaining sauce. Cook an additional 4 minutes or until fish begins to flake when gently pressed. Top with remaining sesame seeds, green onions and grated carrot. Do not overcook.